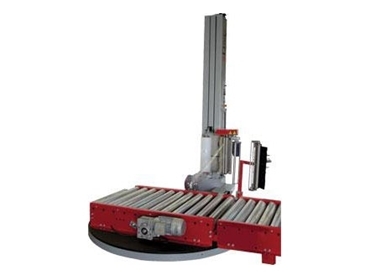 The Senior B stretch wrapper from Accuweigh is remote controlled with a powered roller turntable that automatically out-feeds the pallet. An unpowered roll conveyor at the end of the out-feed holds the pallet prior to it’s removal. Film is automatically hooked, cut and welded into a fully loaded pallet and then fed out to the unpowered roller conveyor ready to receive another pallet.